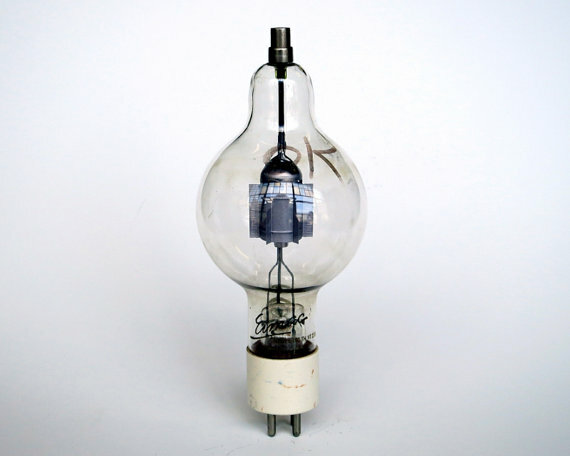 I completed today a purchase of one more piece of Silicon Valley history, the EIMAC 100TH Transmitting Triode Radio Vacuum Tube. For $22 I will receive a working triode, with the birght prosepct of lighting its filaments again perhaps not to transmit but at least to show its colors on the oscilloscope. EIMAC operated in nearby San Bruno this was not an accident, as the San Francisco Bay Area was an early center of ham radio with about 10% of the operators in the United States in the early 30's. Incidentally in a new sense San Bruno is still a ham radio hub today. Except the radio has been replaced by the internet, and the communications device is YouTube, based in San Bruno. There's are some more interesting technical bits. 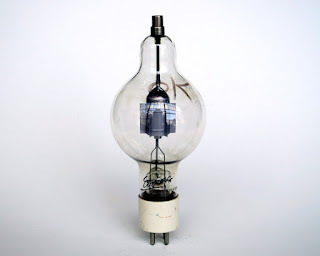 The EITEL company was a spin-off from Heintz & Kaufman with the purpose to produce tubes that worked on lower voltages than those available to the amateur market at the time. In 1932 two radio amateurs, Jack McCullough (W6CHE) and Bill Eitel (W6UF) who at the time worked at Heintz and Kaufman, decided to build high power transmitters to work some of the 20 meter overseas stations being heard in California. They found to their dismay that the expensive transmitting tube they purchased refused to work at 1,000 volts and that was all the high voltage their power supply would provide for them. This had the effect to reduce the price of building radio-transmitters and very likely contributed to their affordability and expansion of use at the time, without undercutting the high end of the market. With the price of $24 in the thirties this is equivalent to about $450 in 2017. Certainly a much more affordable unit for the Ham radio population. 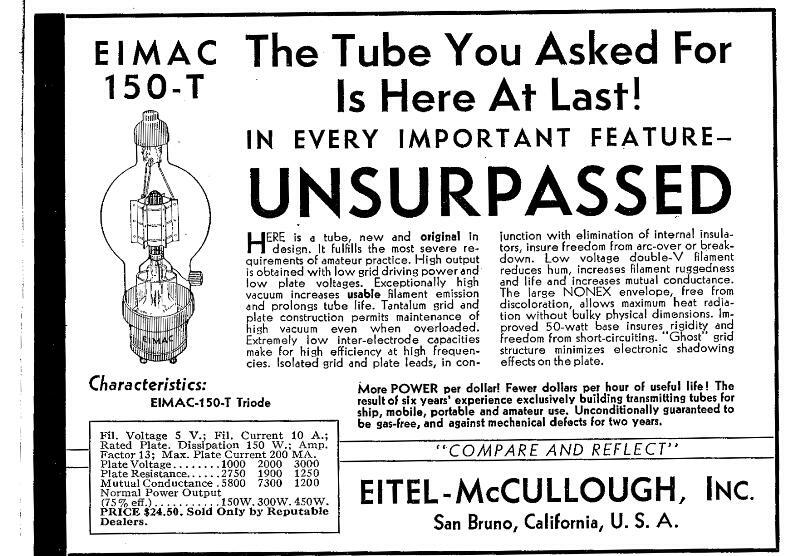 In late 1935 some tubes were sold to the U.S. Naval Research Laboratory for use in an experimental radar set that worked on 200 MHz. The 50T was the only tube that provided sufficient pulse power and that was able to stand up to the high plate voltage. 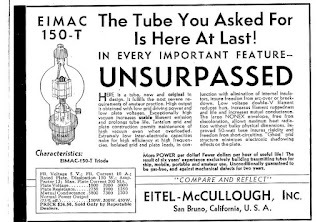 More tubes were ordered by the military and in 1939 the first Navy sea radar tests used EIMAC tubes.The company later on moved its production from San Bruno to the nearby town of San Carlos. The EITEL legacy still lives today as part of Palo Alto based CPI. Now why, industrial maternalism? It turns out that a union organizing drive in 1939-40 by the strong Bay area labor movement was fought off by EIMAC by adopting a strategy of welfare capitalism which included pensions and other generous benefits, profit sharing, and such extras as a medical clinic and a cafeteria. This is not unlike Google and YouTube being the best place to work for years in a row. 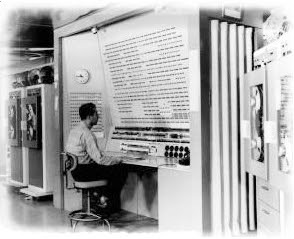 If you were working at Google or Apple today you may be thinking this is a new development or perhaps just a more recent one tracing back to the ascent of the high tech computing industry. Well you would be wrong, this mode of operation seems to have started much earlier at least as we see with EIMAC in the mid 30's. So what is this welfare capitalism, wikipedia has the following entry: "Welfare capitalism is capitalism that includes social welfare policies. Welfare capitalism is also the practice of businesses providing welfare services to their employees. Welfare capitalism in this second sense, or industrial paternalism, was centered on industries that employed skilled labor and peaked in the mid-20th century." "Is it not time for some "corporate maternalism"?! Not even a single hit on the term in Google search, the opportunity to define the term and make it a better cousin of paternalism. A caring version of welfare capitalism that works for us in the 21st century." I better get back to the vacuum tube research.